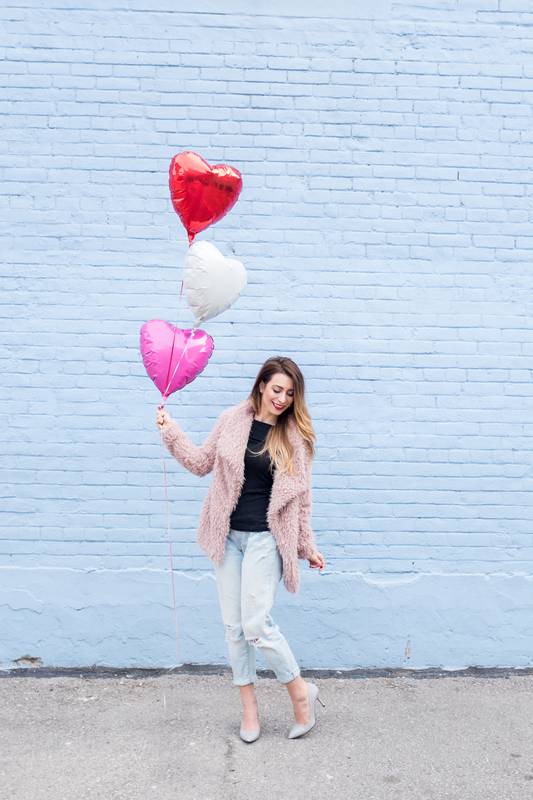 OOTD - Casual Valentine's Day Outfit | La Petite Noob | A Toronto-Based Fashion and Lifestyle Blog. Okay everyone, time to be real: although I've been posting a series of Valentine's Day outfits that involve dresses, heels and the like I will most likely be going casual for Love Day. As much as I enjoy dressing up, my favourite part of the holiday is getting to spend some quality time with Brian and this usually involves take-out burritos and re-watching the last season of Game of Thrones. 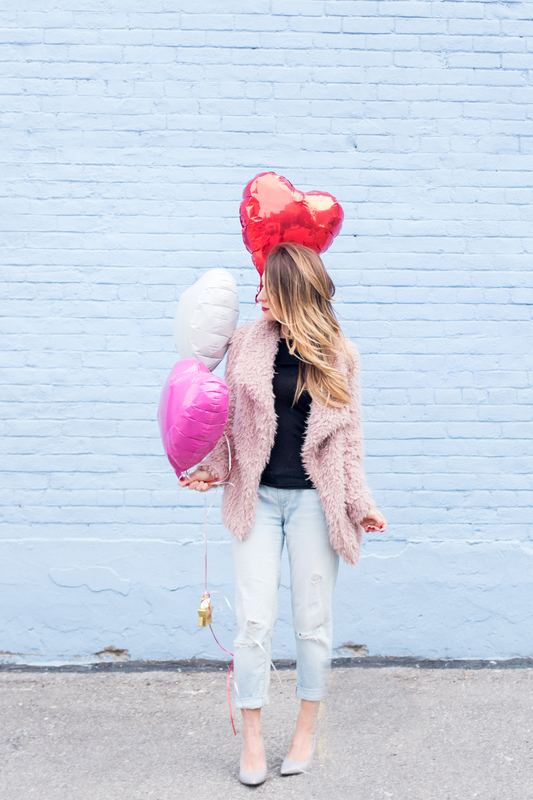 Casual will be the name of the game this Valentine's Day, but that doesn't mean that you have to skip out on the festive details. 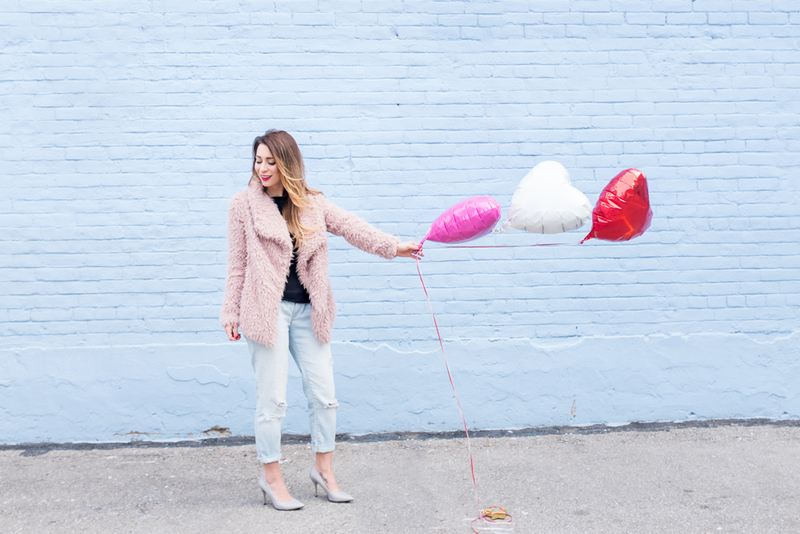 You guys know that I love pairing heels with my boyfriend jeans, and with the addition of a pink faux fur jacket? Perfect! So for all of your casual ladies out there (myself included), I wish you the most fabulous Valentine's Day spending time with those that you love. What do you guys think? Do you think that you'll be dressing up for Valentine's Day, or will you keep it casual? Do you have any big plans this weekend? Let me know! Looking fabulous in casual! I too will probably be ending the night sipping wine on the couch keeping it low key! Love the balloons! So fun. Such a sweet outfit! I love the jeans! So glad that you like them Monique! My too Carmen! I love fuzzy coats, and they're also so practical in the cold! GOT all the way! So glad that you like the outfit, Kris. Happy Valentine's Day! Love this outfit, that sweater looks so cozy. Hope your staying warm on this freezing cold weekend. Thank you so much Filipa! Happy Valentine's Day! Thank you so much Adela! You look absolutely stunning babe. That coat is fabulous! Warm, cozy, and such a statement maker! I also love wearing heels with my boyfriend or distressed jeans. It's a nice contrast. Looking cute!! We'd love for you to link up with us on Tuesdays at our Tuesday Fashion Party Link up! Fabulous!Super gorgeous look on you!You look perfect!! You are really beautiful and charming...The outfit is absolutely adorable.